Also known as the ‘Grape’ or ‘Fuchsia’ Grevillea, in its natural habit Grevillea bipinnatifida is a prostrate ground cover plant. Over recent years it has been grafted to form a very attractive weeping standard plant. A native to western Australia, this species has also been widely used in hybridisation. Growing best in full sun in a well drained soil, the flowers a good size and an attractive fuchsia to red in colour. This is not a frost tolerant species, however it will recover from frost damage over time as it does have a lignotuber that aids this process. As a ground cover plant, or as a standard plant used as a feature Grevillea bipinnatifida offers the gardener the best of both worlds. One of the species used to produce many modern hybrids, Grevillea bipinnatifida is a naturally small species. It is variable in height, from around .5 metres to nearly 2 metres and it is has a naturally spreading shrub. How good is this plant ? It is often sold as a standard where it is grafted onto more resilient rootstock. Its natural weeping or spreading habit gives it an attractive appearance when grown this way. Choose a position in full sun and with a well drained soil. If soil is not well drained, amend to improve drainage or try hilling up the soil to improve the drainage. Water in well after planting. If you are growing a standardised Grevillea bipinnatifida we suggest that install a permanent support stake. Tip prune after flowering to maintain a more compact habit, especially on the standardised types. Fertilise in spring with a native plant fertiliser. Common Names – Grape Grevillea or Fuchsia Grevillea. Foliage – Mid green and prickly. 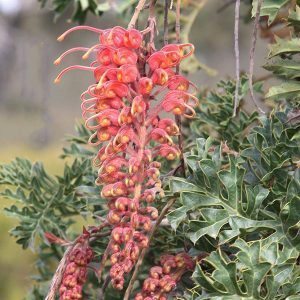 Flowering period – The Main flowering period is in winter to spring, however Grevillea bipinnatifida will flower through the year in good conditions. This wonderful species has been used in hybridisation and is a parent of the famous ‘Grevillea Robyn Gordon’ as well ‘Grevillea Superb’ and many others. 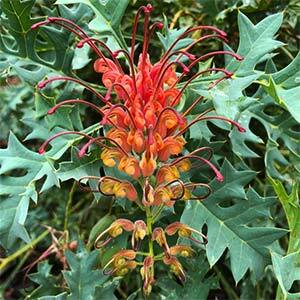 Grevillea bipinnatifida is available for sale from the following participating nurseries.